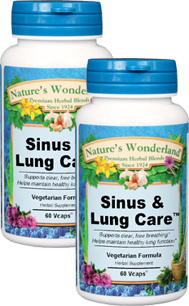 Sinus & Lung Care™ - 525 mg, 60 Veg Capsules each (Nature's Wonderland) - Penn Herb Co. Ltd.
Sinus & Lung Care works effectively to help you feel better. The comforting blend of time-tested herbs shores up the body's immune defense, soothes bronchial and respiratory system and provides warming relief from chills. Pleurisy...relaxes the air passages and improves breathing. Rosemary, Boneset…maintain healthy lung function. Horehound…soothes the throat and bronchial passages. Ginger…provides warming relief from chills. Protects respiratory tract health; helps maintain healthy lung function; soothes bronchial passages; plus Ginger root for warming relief. As an addition to the diet, take 1 or 2 capsules three times daily with water at mealtimes. SEE PRODUCT LABEL FOR CAUTIONS.